Global have extensive experience in not only mining minerals, but also in providing civil construction services. Our fleet of surface miners are used for accurate cut to fill operations to prepare sites for civil projects. 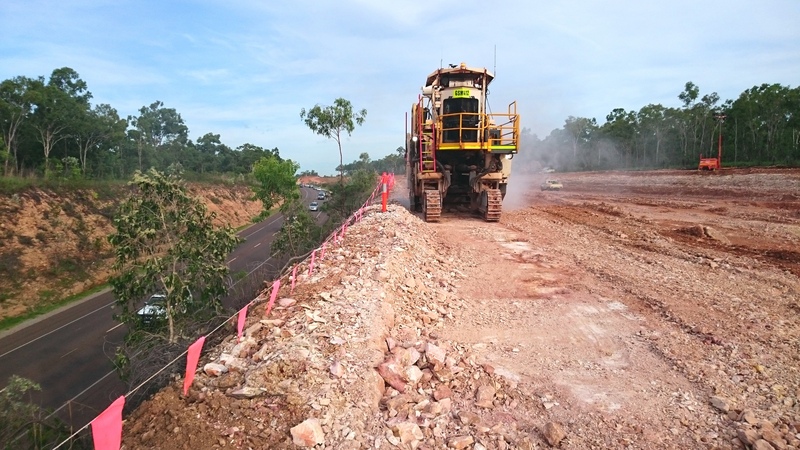 Surface miners cut a route through existing rock, which then forms an ideal subgrade for the different pavement layers of the road or rail to be built. An additional advantage of this is that transport vehicles can travel on the stable surface over the entire construction period without causing damage. One of our more common services is cutting an area of material to be used as fill at another project location. By using a surface miner, it means significantly less machinery and ancillary gear is required onsite, such as dozers, loaders, graders, and crushing machinery; the surface miner cuts, crushes and loads the material in one process. In addition to this, the surface miner leaves an accurate level floor; material can be re-used immediately, or can be conditioned for subgrade or general fill. Global offers a full service to upgrade haul roads. The surface miner crushes larger rocks into road base material and mixes the fines on top back into the base. This creates a homogenous road base mix which increases compaction and results in a precise cross section and clean subgrade. Global have achieved excellent results in this area, with reduction in wear and tear on tyres, axles and chassis on numerous trucks and lights vehicles travelling on haul roads. This benefit delivers huge cost savings and ensures less downtime. Global can also perform accurate subdivisional work in areas where rock hardness prevents bulldozers from ripping. Surface miners are efficient machines for subdivisional work, as the material can be re-used as fill without requiring further crushing. The machine design makes it a perfect suit for terraced levels, accurate surfacing and precise box-outs or drainage channels. Cutting trenches or lowering the floor of water reservoirs is yet another field of application for surface miners. The machines cut the cross-section of trenches or reservoir floors cleanly and with utmost precision, strictly adhering to the specified tolerances. Precise lowering of the floor when increasing the cross-section of tunnels is a typical application in tunnel construction. In the construction of new tunnels, surface miners are used for cutting the bench while levelling the floor at the same time.